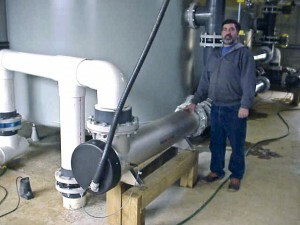 Co-owner Rick Brown alongside the industrial-strength sand filter and UV sterilizer at the Patrick County Farm. Your customers depend on you for healthy, dependable fish. And you can depend on us. We know that stocking strong, healthy, vibrant Koi, Butterfly Koi and Goldfish is crucial to your business. Offer anything less, and you risk losing customers. That’s why we go to great lengths to offer the healthiest fish possible. Blue Ridge Fish Hatchery operates under a strict bio-security plan. This plan ensures that our farms and holding facilities avoid possible contamination from outside threats. We have operated as a closed facility since bringing in new brood stock in 2003. No new fish have been brought onto our premises. We have not added any new brood stock, and any fish that leave our facilities are never allowed back. All imported goldfish are quarantined off premises, in a separate facility, to avoid possible contamination to our farms. Passing through the sand filters first, water is filtered down to 20 microns. From there, water is sent onward to the UV sterilizers, which kill any viruses present in the water. Sensors monitor the UV dosage constantly, and the water flow is shut down automatically if the dosage ever falls below the known kill rate for SVC (spring viremia of carp) and KHV (koi herpes virus). After passing through treatment, the water is sent on to our ponds and holding facilities. Upon completion of the treatment, our water is parasite free and literally clean enough to drink. 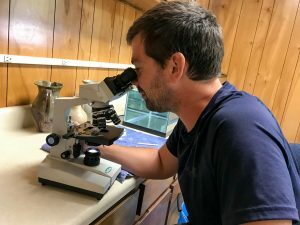 Third-generation koi farmer Josh LeFever examines a sample by microscope. We operate over 200 mud ponds, with each monitored closely to ensure optimal fish health. Parameters such as dissolved oxygen levels, ammonia, nitrite, pH and salinity are closely monitored and adjusted in order to provide the best possible environment for Koi and Goldfish to thrive. Additionally, samples from each pond are examined microscopically for parasites and other health issues. Any affected ponds are treated accordingly. Inside one of our many quarantine facilities. Each tank is approximately 1000 gallons. Koi and Goldfish can have health issues that are not apparent while they are in the pond, but become apparent after they are harvested and brought into our holding facilities. For this reason, everything we sell is quarantined for a minimum of 14 days before being sold. All Koi and Goldfish are kept in greenhouses at temperatures of 70 to 75 degrees, where health issues are most likely to become apparent. All fish are monitored closely. A sample from each pond is examined microscopically to search for the presence of parasites. If health issues are found in any batches of fish, sales of all fish from that pond are suspended until we can verify that the issue has been resolved. 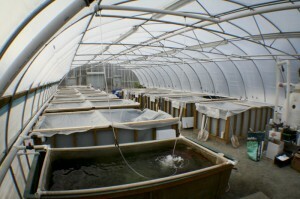 Extensive research and a recommendation from Dr. Eric Johnson at koivet.com led me to Blue Ridge Fish Hatchery. I visited Blue Ridge and received a tour of the mud ponds, the distribution facilities, and met with the entire staff. I was very impressed with the operation. As a result we started purchasing fish and food and have never looked back. It’s the quality of the product, the attention to detail and the personal service I receive from Randy and Rick that makes us a good match. We appreciate all the help we receive from Blue Ridge Fish Hatchery and value our relationship.